The costs of remedial work to address wind noise issues is often quite high, especially when compared to the cost of engaging Windtech Consultants to undertake a desktop wind-induced noise assessment. Façade elements are a common source of wind noise in buildings. Engaging Windtech Consultants at the outset, before the façade elements are fabricated, can avoid very costly rectification work to mitigate wind noise issues in buildings. Windtech have undertaken substantial internal research on this topic since the mid-1990’s and have completed over 100 investigations since that time. These include a significant number of remedial studies. Our ability to identify problems and cost effective solutions quickly is a direct reflection of our experience. An example of one such remedial wind-induced noise study was wind-induced noise and vibrations on the horizontal aluminium circular hollow section (CHS) sunshades situated along the top of the façade of the Workzone Building located at 202 Pier Street, Perth (pictured above). Structures such as these have been reported to exhibit large wind induced excitation. These have been due to both vortex-induced excitation and wake interference excitation mechanisms. Structures such as this will be particularly susceptible if they have either low damping or low mass. After testing the sample in the wind-tunnel it was determined that the CHS members were mainly influenced by the resonant response to the vortex shedding frequency. Several treatment options were proposed including mounting the louvres on rubber connector rings, removing every second circular member from the sample, and having expanding foam inserted to various circular members. Of these the adopted solution was to insert expanding foam into the first and seventh members. The hardened expanding foam within the circular members resulted in a reduction of the natural frequency (which lowered the critical velocity) as well as providing additional damping and mass. 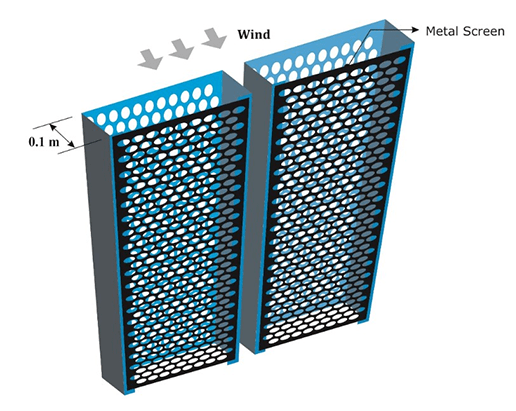 The expanded metal screens were most effective in completely eliminating the harmonics between the vortices shed behind the original screens. The punched metal screens with a randomised pattern was also effective for most of the cases and generated a low amplitude noise for one angle of attack in high wind.